When a beloved family member falls victim to a debilitating illness, it's devastating. When the diagnosis becomes terminal, the pain becomes indescribable. When a possible medical alternative is refused to your loved one because of bureaucracy, desperation sets in. 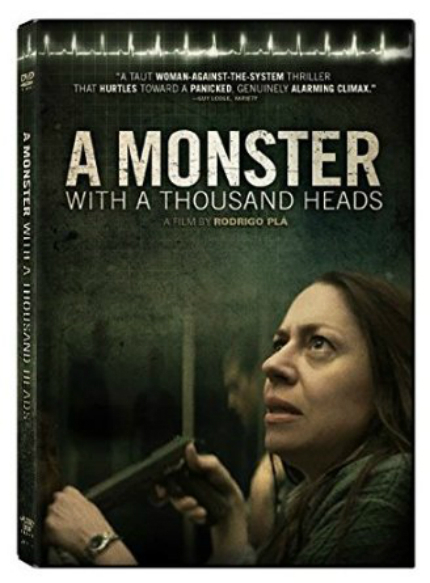 In Rodrigo Plá's A Monster With a Thousand Heads (Un monstruo de mil cabezas), desperation sets in early. Sonia Benet (Jana Raluy) is awakened in the night by her husband. He is terribly ill. Not yet 50, he has been struck down by cancer, and his condition has rendered him unable to care for himself. Sonia's family is already accustomed to the rigors of long-term care, but that doesn't make it any easier when it happens again and an ambulance must be summoned. The medics tell Sonia that her husband's condition has become terminal. He has an upcoming check-up appointment with a physician in a few weeks to discuss alternative treatments that Sonia wants to pursue, but, obviously, things can't wait. Sonia heads to the doctor's office the following morning with her teenage son in tow ... and waits ... and waits ... and waits. It's noon on a Friday, and all the doctor (Hugo Albores) wants to do is slip out of the office, which he does, intending to join his friends to play some tennis and then retire for the weekend. Sonia, however, has been waiting all morning. Her husband is deathly ill and is worsening; he's going to die unless something is done. The doctor could prescribe medication that might extend her husband's life, and all that anxiety and stress and the sleepless nights have made her desperate. So when the receptionist at the doctor's office flips her off, in effect, Sonia boils over. From there, Sonia becomes more desperate, more outraged and more angry. She does things she probably never could imagine she might do. Desperation, and pain, and love can drive people to do things like that, especially in the face of unthinking, unblinking and infuriating bureaucracy. Writer Laura Santullo sets things up simply and directly; the dialogue always sound authentic and passionate. Director Rodrigo Plá presents events as in a film noir, as though the outcome is inevitable, no matter what anyone might do to try and change that, and the realization that dawns upon the viewer is one of dread. The conclusion is a touch heavy-handed, lending an air of evil fictional manipulation to a drama that is perfectly agonizing as it is. Real life doesn't need any manipulation to be entirely desperate all on its own. A Monster With a Thousand Heads proves to be an indelibly painful experience, yet it doesn't necessarily feel that way as it unfolds. It's a thriller that could halt at any moment, which is probably what makes it feel so haunting. Music Box Films will release the film on DVD on Tuesday, August 9. The film wil also be available via various Video On Demand platforms (iTunes, Amazon Instant, Google Play, YouTube, Vudu) on the same day. I watched an advance copy of the DVD and the transfer looks good. Even though the film takes place in a number of locations, both indoors and outdoors, it always feels confining and claustrophobic, displaying a more limited range of colors, and the DVD reflects this well. Two audio options are offered (Spanish 5.1 Dolby Digital and Spanish 2.0 Dolby Digital) and optional English and Spanish subtitles are available. I watched the movie with English subtitles, which were easy to read and well-timed. The DVD includes the theatrical trailer and several deleted scenes totaling just over 7 minutes. They all take place in the final portion of the film; their exclusion strengthens the impact. The theatrical trailer, which we've included below, features quite a lot of potential spoilers, though it does emphasize the thriller element of the movie and serves as an effective hook. Exclusive Clip: A MONSTER WITH A THOUSAND HEADS, "This Will Get Worse"